Perl 6 is an excellent, modern language which exhibits a number of features that makes it interesting for evolutionary algorithms: being able to work with concurrent processes and functional programming. 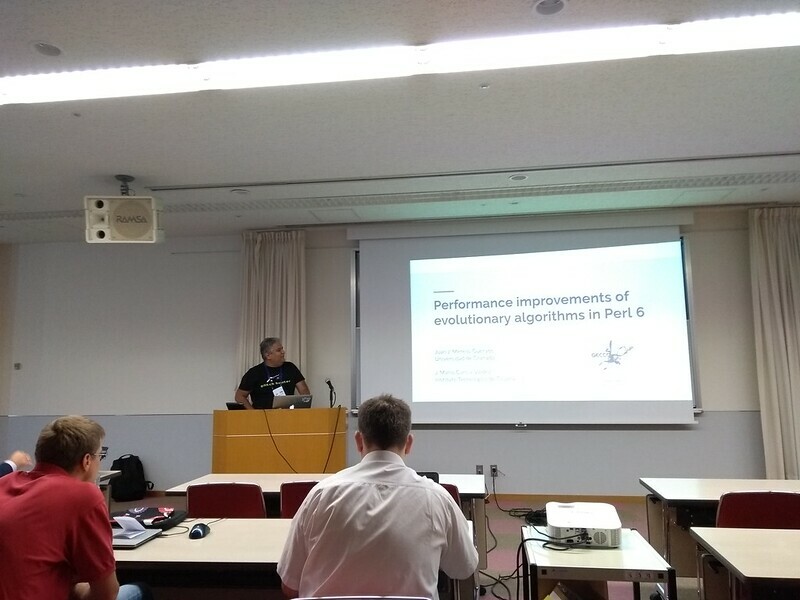 During GECCO 2018, Dr. Mario Garcia Valdez and me presented a couple of papers in two different workshops. This was presented as a part of the workshop on big data and massively complex problems, as a matter of fact, it was one of the two papers presented during the workshop. The presentation is available from GitHub, along with sources for the paper and all kind of data. The paper is published as open access by ACM Digital Library. It was included in the EvoSoft workshop, to which we attend regularly. The presentation also has a CC license, and paper source and data are available in GitHub. The paper is also available as open access from the GECCO companion. These were not the only contributions to GECCO; coming up the rest of the posters, tutorials and other stuff done in Kyoto and Osaka.